[SINGAPORE] Bus and train fares are set to rise by as much as 4.3 per cent next year, going by a new component in the review formula. In a statement Monday (Sep 3), the Public Transport Council said the 2018 review will include the network capacity factor (NCF), which tracks how much bus and rail capacity has changed in relation to actual usage. The NCF, indicating that ridership had not kept up with capacity growth, will lead to a 3 per cent hike as part of the review . 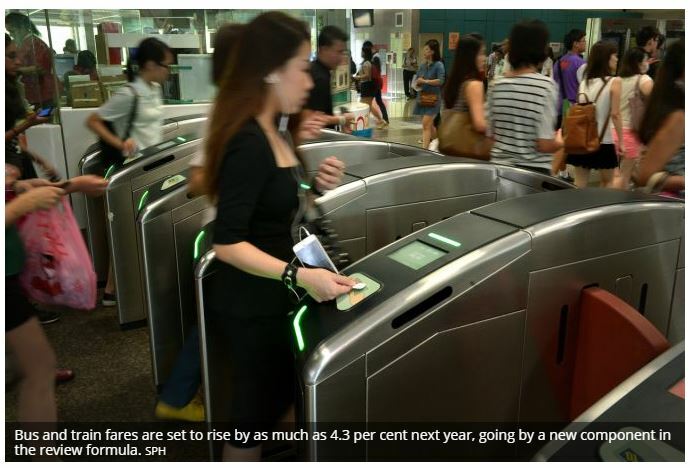 Council member Vincent Chua said the 4.3 per cent increase provided for in the formula, if granted in full, “should not result in fares increasing by more than 10 cents per journey”.